What have I been doing. Over the last few months I have been working on my Roll Roll on Boll quilt. 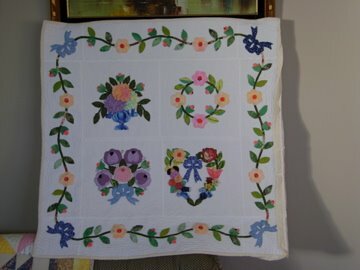 A mystery quilt by Bonnie Hunter of Quiltville Custom quilting. Bonnie posted it on her blog last year and I have been slowly sewing 2 inch squares and small triangles together I think I must be mad. See the row of 2 inch squares set on point, they will become the border. There are some seriously ugly fabrics in these squares and triangles. But now that it is coming together it looks pretty good to me. I hope you think so too. Thanks to all of you how have visited.